Rome is one of the most popular destinations in Europe. The history, beauty, food, and culture attract travelers of all types. There are a range of accommodation types available to visitors. 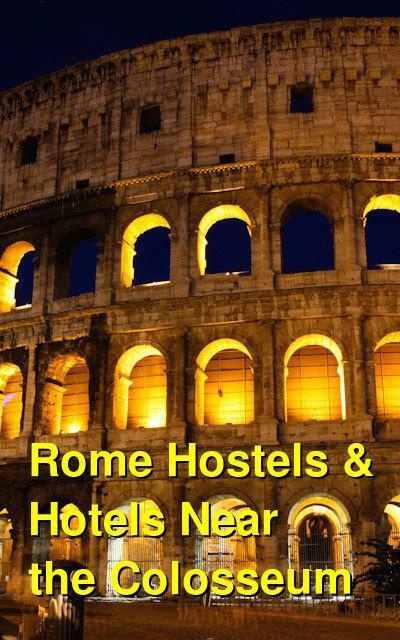 If you're a budget conscious traveler who's looking for a good hotel or hostel near the Colosseum, then the ones listed below are convenient. The Colosseum is centrally located near many of the city's best attractions and is also close to public transportation. It's a great place to base yourself during your visit to Rome. This family run guesthouse is perfect for couples or travelers who are looking for more privacy at the cost of a hostel. If you have a travel companion, you'll find the price is almost equivalent to what you would pay for two beds in a dorm, and for this price you get a private room with a private bathroom. The atmosphere is comfortable and welcoming and there are plenty of amenities including breakfast (for an extra charge), travel information, in room televisions, a safety deposit box, air conditioning, wi-fi, and more. 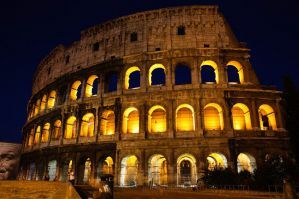 The guesthouse is conveniently located just a three minute walk from Rome's famous Colosseum. The Colosseum is just next to the Roman Forum. It's also about 15 minutes by foot from the Termini train station. Public transportation is close by and you can easily catch either a bus or metro to travel anywhere else in the city. This is a great little bed & breakfast that is conveniently located and perfect for people spending any amount of time in Rome. It has a personal and comfortable atmosphere in a late 19th century building with a great view of the city. It's located on the 5th floor but is easily accessible with a lift. The views look out on things such as the Church of Santa Maria Maggiore, Piazza Venezia, and Saint Peter's in the Vatican. You can choose between single, twin, double and triple rooms that are well furnished with a sink and mirror as well as central heating. In addition to being close to the Colosseum it's also about 250 meters from the main Rail Station in the city, so you can easily access it as you arrive or depart the city. This is a quiet and comfortable place to stay that is conveniently located right in the middle of the city. The rooms are furnished in a modern style with attached, private bathrooms and wi-fi access. There is a common room available to guests which offers a fridge and hot plate. The reception area is open 24 hours a day. The hotel is conveniently just a short walk from not only the Colosseum, but also the Roman Forum and many different churches, museums, restaurants and cafes. Public transportation is very close by so you can easily access other neighborhoods throughout the city. This is a convenient and affordable place to stay.